I remember these machines when I was a little boy in the late 1960's - early 1970's. We use to go on vacation every other summer, and I lived in Maryland, and we traveled by car, down to Miami Beach (when it was still nice and safe…the good ol' days). Anyway, we would stop periodically at state-sponsored, roadside tourist rest stops. These places had little giftshops, maybe a tiny restaurant, racks of brochures for tourist destinations, and an info center. Usually, in the center of these buildings was one of these plastic molding machines. It was encased in a big clear bubble, and you could watch it make your toy. I loved these things and found them so fascinating. I remember I owned a couple of them, but the only one I distinctly remember was a green alligator. Sadly, I think I threw them all out when I got older. I remember these in Los Angeles. They had several at Griffith Park, and I know they were there until at least the early 1980's. What ever happened to my Transylvania Twist? Griffith Park had Frankenstein Mold a Rama's ? I thought they were only at Universal. No, I would think Frankenstein's monster would have only been Universal. I was referring to the Mold-A-Rama machines. 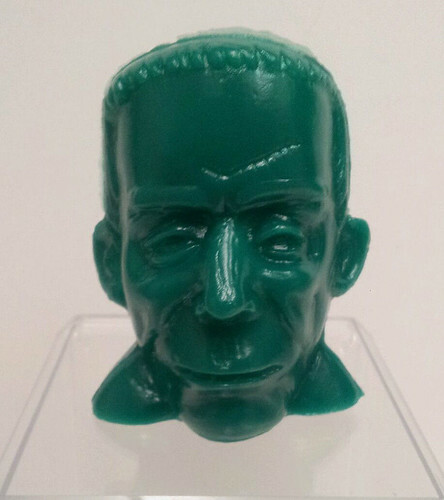 I think the generic Frankenstein bust banks might still be being made. They were being produced at a zoo back east as Halloween specials not too many years ago. Funny thing about the standing Universal-style Frankenstein (with neck electrodes), I have seen them with and without "Universal" on the back of the bases. Were they made at Universal with their name, and at other venues without their name? 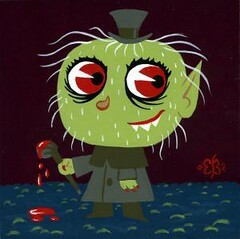 Or are all the "Universal"-less standing Frankenstein's pirated after their official production had ceased? 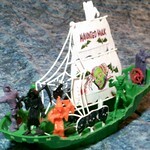 I posted this over at "Vintage Monster Toys / Show Off Your Weekly Finds". I thought maybe it would fit here, too. I missed out on a Blue Mold-A-Rama Frankenstein recently. The darned thing went for over $200.00. A badly-listed Pink Mold-A-Rama Frankenstein popped up on eBay so I took a shot at it. I got it for $46.00 - more to my liking. All of the figures say "FRANKENSTEIN" on the base front in incised letters. PICTURES CO., INC." in incised letters. PICTURES CO." in incised letters. The Green figure's base back says: "UNIVERSAL STUDIOS" in raised letters. The Black figure's base back is blank. It was produced after the official Universal Park run, by a Mold-A-Rama machine owner as part of a VERY limited test run. Except for the color and the fact that the back of the base is blank, it is identical to the others. Any members have other variations on their Moldy Franks? Here's to swimmin' with bow-legged women. I have yet to get one of these guys. Thats weird they have different markings, figured they would all be the same. They look great together, wonder how many possible colors there are out there? I'd like to know more about these figures. 1. What UMA members remember seeing these machines at Universal? 2. What year(s) did you see them? I know these Universal Studios Standing Frankenstein figures are rare. Just try to find photos of them on the Internet. Wow! That fellow's Mold-A-Rama collection is awesome! You certainly have him beat in the Frankenstein department though. And it looks like Frankensteins in orange, purple, white, and several more shades of green and blue anyway might exist for you to try to add to your present collection. Grey - Seen on eBay in 2008. Adam, what do you mean by "standing" Frankenstein ? I'm not that familiar with these. 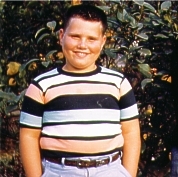 My family took the Florida jaunt every summer from TN down to the Tampa/St. Pete/Clearwater area then across to Daytona Beach and back through Brunswick, GA. We always stopped at the big gift shops on the way down, Stuckeys was a fave, then we had to hit the Florida welcome center to get the latest brochures and that free orange juice . I picked up a Mold-A-Rama alligator at Silver Springs one year. It's still with me and resides unscathed in one of my monster/dinosaur shelves. Once in awhile you see these blow mold pieces at antique malls. They seem to trend in the $20 range if in nice condition. This was called a "Standing Frankenstein" by someone years ago and the name has kinda stuck. It could just as easily have been named a "full-bodied Frankenstein" or the "Universal Frankenstein", since that seems to be the only official place it was ever produced. At 7" tall, it is a little large as Mold-A-Rama figures go so it takes more plastic to produce. It is also a licensed item. Therefore, it cost $1.00 to buy from the machine. It is quite scarce. This is commonly known as the "Frankenstein Bank", although it is often also referred to a "Frankenstein Bust". Even though it is not very big, it comes with an uncut slot in the back for coins. 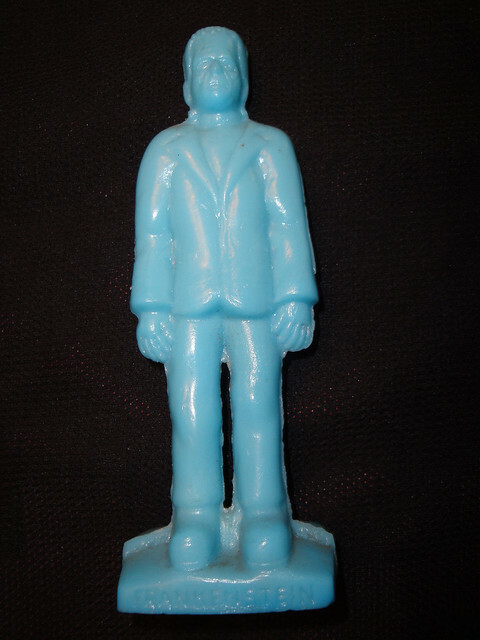 It is a typical, small Mold-A-Rama figure at about 3" tall, that takes less plastic to produce and is not licensed. It originally cost only 25¢ to purchase from a machine. It is still being produced in lots of different colors. It seems to be a favorite for a few zoos that do night time tours around Halloween. The holiday gives them an excuse to extend their normal operating hours and show off their nocturnal animals. It is pretty common. Hope I was clear and this is helpful. Adam, as usual, you gave me a wealth of information. Now I'm going to start hunting for a standing Frankenstein. Thanks again.